An FIA GT race around the former palace in Bucharest didn’t quite happen in 2006, but the third round of the 2007 Championship (May 20) should see a huge crowd drawn to the two hour race in the Rumanian capital – based on the attraction of November 5’s launch of the event. Thomas Biagi, Karl Wendlinger, drivers from the Renauer Motorsport Team and leading Romanian drivers such as Mihai Marinescu, Doru Sechelariu and Claudiu David were all present, along with local dignitaries, SRO’s Stephane Ratel and circuit designer Hermann Tilke. That should please Michael Bartels, in particular. The last stop for the 2006 FIA GT Championship is Dubai, on November 17-18 - which is where the cars are heading now. 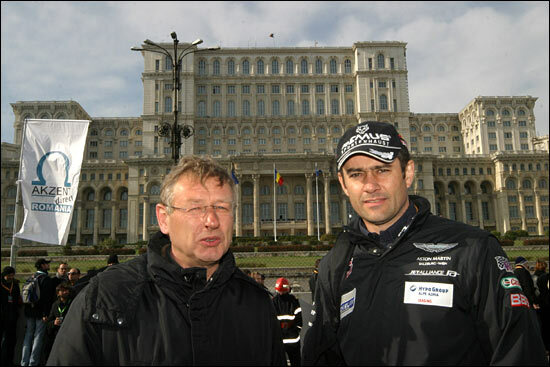 Hermann Tilke and Karl Wendlinger are pictured yesterday in front of what is now the Romanian parliament building - by volume, the third largest building in the world. Most of the 6,000 rooms are unused. 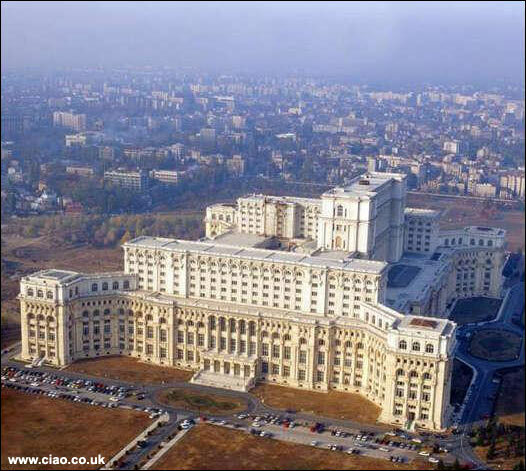 The top floor, with its ceilings 50 feet up, was to have been the Romanian dictator's personal residence.